Austin+Mergold, Folly 2014: SuralArk, Socrates Sculpture Park, 2014, New York, NY. Photo: Nate Dorr. 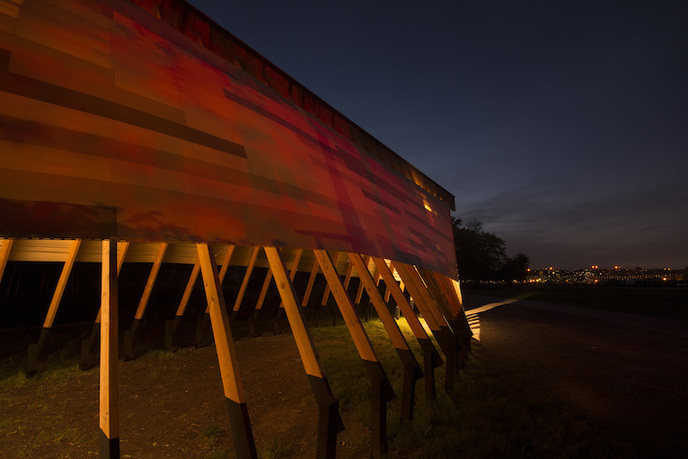 Socrates Sculpture Park, with the Architectural League of New York, continues to explore the intersection of sculpture and architecture by commissioning new works of early-career architects and designers through Folly 2014, a design/build studio residency and outdoor exhibition. Now in its third year, Folly has grown from a pilot initiative to a highly anticipated annual opportunity to conceive, design, build, and exhibit original works in the public realm. By offering more than four acres of open space as a platform for imagination and creation, Folly liberates the designer from limitations of program-defined structures and encourages development of experimental and visionary work. And by placing the residency in the park's outdoor studio, open 365 days a year, the project integrates the public at every stage. In 2007 Aleksandr Mergold, along with Jason Austin, established architecture and landscape design practice, Austin + Mergold.Mergold is an assistant professor at Cornell's Department of Architecture, an AIA member, and is a LEED Accredited Professional; Austin is an assistant professor at Drexel University's Department of Architecture, and a guest design critic at Cornell and Lehigh Universities. Austin + Mergold sees its work process as "slow architecture." Believing that it is preferable to rethink and repurpose existing resources than to tap new ones, A+M infiltrates existing systems that are responsible for built form, rather than reinvent the wheel each time. A+M explores local vernacular conditions to discover how an efficient (and economical) reconfiguration of available materials, forms and methods, informed by the latest advances in technology, can result in an improved quality of life for communities and individuals. John Hatfield is the executive director of Socrates Sculpture Park. Previous to Socrates, he worked for seventeen years at the internationally acclaimed New Museum of Contemporary Art, New York, where he held various positions from 1992 to 2002 and 2004 to 2011, including deputy director in 2008. As deputy director, Hatfield contributed to the development and execution of strategic planning in all areas of the museum. In addition to his tenure at the New Museum, Hatfield served as assistant vice president for memorial, cultural, and civic programs at the Lower Manhattan Development Corporation, working on the 9/11 memorial design competition, selection process, and cultural planning. He has also worked for the Arts and Events Program of the World Financial Center, consulted on public art projects and architecture, been a visiting critic at Yale School of Architecture, and served on Percent for Art panels. Rosalie Genevro is executive director of the Architectural League of New York. For over twenty years, she has pursued its mission—to nurture excellence and engagement in architecture, design, and urbanism—through innovation in live events, exhibitions, and publications. Genevro has conceived and developed projects that have mobilized the expertise of the league's international network of architects and designers toward applied projects in the public interest, including Vacant Lots, New Schools for New York, the Productive Park, Envisioning East New York, and Arverne: Housing on the Edge; initiated and directed major traveling exhibitions, including Renzo Piano Building Workshop: Selected Projects and Ten Shades of Green and Urban Life: Housing in the Contemporary City; and originated the online projects Worldview Cities and Urban Omnibus. Earlier in her career, Genevro was research director of Advisory Services for Better Housing, and she published research on the early years of the New York City Housing Authority. Anne Rieselbach has been program director of the Architectural League of New York since 1986. Rieselbach organizes many of the league's lectures and symposia, and has curated exhibitions of contemporary and historic architecture. For the past thirty years she has directed the Architectural League Prize for Young Architects + Designers and the Emerging Voices series. The League Prize—a nationwide competition, lecture series, exhibition, and for the past thirteen years, catalogue—spotlights work by talented young architects who have been out of school for less than ten years. Emerging Voices, chosen through an invited competition, brings outstanding mid-career architects to New York to present their work. Elissa Goldstone is the exhibition program manager at Socrates Sculpture Park and has been working in contemporary public art for over five years. Originally from Brooklyn, NY, Goldstone holds a BA in studio art from Bard College. Upon graduation, she worked in fabrication and installation for the contemporary artist Petah Coyne. In 2008, she joined Creative Time, where she produced several large-scale national public programs, including Jeremy Deller's It Is What Is: Conversations About Iraq (2009), the group-exhibition This World & Nearer Ones (2009) on Governor's Island, and the acclaimed Art Basel Miami Beach Oceanfront installation and performance series (2009 and 2010). Lars Fisk is the studio and facilities manager at Socrates Sculpture Park. He received a BA from the University of Vermont, which included a semester of study at Temple University in Rome, and an MFA from Columbia University's School of the Arts. His sculptures have been exhibited in venues including the Fleming Museum, Burlington, VT; Hood Museum of Art, Hanover, NH; MoMA PS1, Long Island City, NY; and the DeCordova Museum and Sculpture Park in Lincoln, MA. He has been an artist-in-residence at Franconia Sculpture Park; Sculpture Space; Socrates Sculpture Park; and the Skowhegan School of Painting and Sculpture. Founded in 1986, Socrates Sculpture Park is the only site in the New York metropolitan area specifically dedicated to providing artists with opportunities to create and exhibit large-scale sculpture and multimedia installations in a unique environment that encourages strong interaction between artists, artworks, and the public. The park's existence is based on the belief that reclamation, revitalization, and creative expression are essential to the survival, humanity, and improvement of our urban environment.